The Public Policy Forum is thrilled to announce that Satyamoorthy Kabilan has joined the national think tank as its new Vice President of Policy. 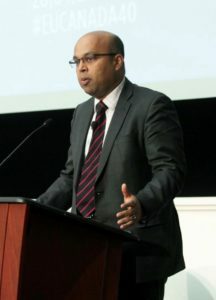 Kabi, as he’s widely known, comes to PPF after five years at the Conference Board of Canada, where he was most recently Director, National Security and Strategic Foresight. Before coming to Canada, he worked for the British Home Office, founded and managed two technology start-ups and led a research team at the University of Cambridge. He is a scientist, entrepreneur and internationally recognized expert in cyber security, emergency management and national security issues. He also has done work on long-term policy development, human resources strategy and the future of work, which will prove to be invaluable as PPF embarks on a three-year research initiative with the support of TD Bank and other partners. Born and raised in Kuala Lumpur, Malaysia, Kabi studied at Imperial College in London and has a Ph.D from the University of Cambridge and an executive MBA from the London Business School. He says he chose Canada because of its values and quality of life but also because it would keep him close to family – his wife was born in Ontario. In a world of profound uncertainty, PPF is equally excited about Dr. Kabilan’s work in the field of strategic foresight. The goal of strategic foresight is not to predict the future but to offer private, public and third sector decision-makers tools to prepare for a range of possibilities. The challenge of a rapidly evolving environment requires more robust, long-term approaches to strategy, risk and especially policy, to ensure future success. “On top of his strengths on substantive policy matters, PPF is delighted to have in its senior ranks someone who can work with our members in their strategic and scenario planning to prepare for an unpredictable future,” Greenspon said. Follow Kabi on Twitter or on LinkedIn.